I love the look of coloured heirloom carrots. Clearly, they can be cooked in any way, but I needed a stove-top method. This is a simple recipe with respect to instructions and is ready to serve in about 10 minutes. Cutting the vegetables into matchsticks can be a bit time-consuming but can be done ahead of time. I have to admit that the prep is a wee bit fiddly. You have to slice the zucchini thinly and then coat each in crumbs. Just go into Zen mode and you’ll be a half hour away from a heavenly treat. I have now made them several times, so will share the variations and what worked for me! A delicious meal using quinoa - ever popular partly because it is considered to be a protein and gluten-free. 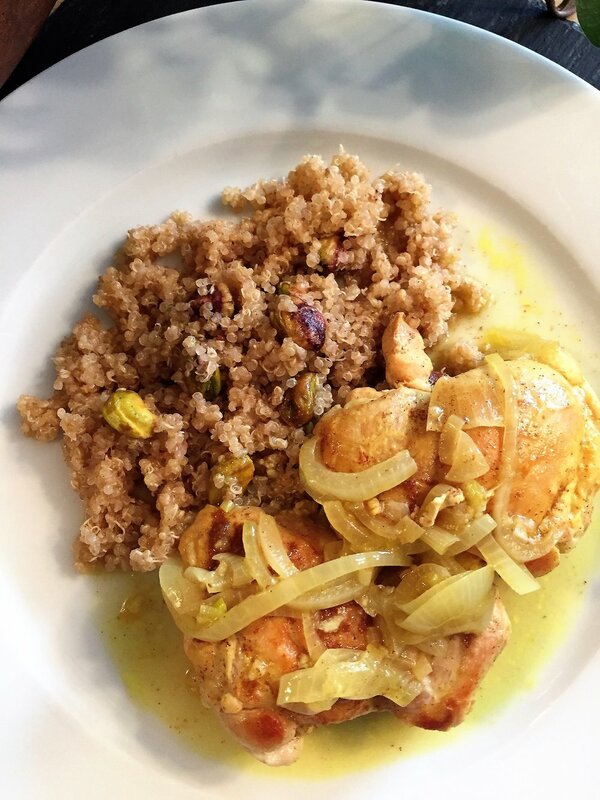 The butter, honey, cinnamon quinoa pairs well with the Moroccan spices (cinnamon, ginger, turmeric, coriander) that flavour the chicken. You'll make this time and time again! The summer squash called "vegetable marrow" is appearing at markets (mid-August) and there's still time to make this iconic Hungarian dish. "Creamed vegetables" - called főzelék - is classic Hungarian home-cooking. They can be used as sides, or as the main course served with eggs or Hungarian meatballs (fashirt). There's a fairly long list of vegetables that are creamed - the most common in my own experience being yellow waxed beans (babfőzelék) and this vegetable marrow (tökfőzelék). So good!